If you have a dog in your life, this book is an absolute must!!! 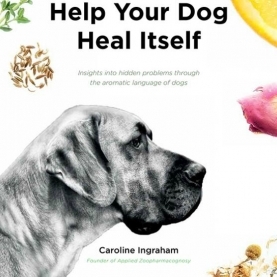 We, Cindy and Joy, ( owners and clinically certified aromatherapists) have taken many courses with Caroline and the information in this book will help you help your dog. If you are like us, our pets are our babies. We would lay down our lives for our fur babies. Those of you who know us, know Bella Chica and know that we would NEVER do anything that would put her in harm's way. We have worked with our dogs and have helped many canine clients following Caroline's methods. You will not be sorry if you purchase this book! Whether you are working with rescued dogs or wondering why your dog from a loving home has a behavioral problem, allowing them to address their issues naturally can reveal hidden causes and bridge the communication gap between dog and carer. The language of dogs is through smell and in this book you will learn how you can use this language to gain an insight into where they may need support, helping them to transform their lives, as well as learning how to work with common physical ailments.